Born at Chattanooga, Tennesse,December 3, 1892, into the family that started the New York Times, he was more fascinated with the military way of life. He served gallantly in World War I and received the Distinguished Service Cross, the Purple Heart, the Silver Star and the French Croix de Guerre. He died on October 2, 1955 and was buried in Section 2 of Arlington National Cemetery. 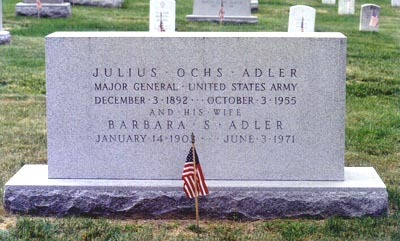 His wife, Barbara S. Adler (January 14, 1903-June 3, 1971) is buried with him. 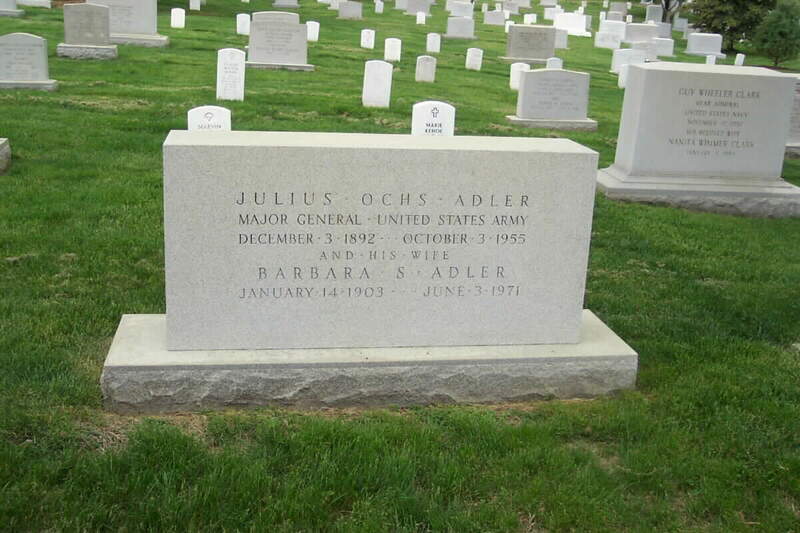 Brigadier General Julius Ochs Adler is another decorated hero of World Wars I and II. In World War I, he was the commander of a battalion of infantry on the Western Front in France. He was in many battles with the Germans and was gassed. In World War II, General Adler commanded the 77th Infantry Division, responsible for the defense of Hawaii from 1941 to 1944. For his leadership and bravery in World War 1, he received the Distinguished Service Cross, the Silver Star with Oak Leaf Clusters, the Purple Heart, the French Legion of Honor and the Croix de Guerre with Palms. In 1948, he was appointed as major general in the Army Reserve. After World War II, he joined The New York Times as vice-president, later to become general manager. He was also the publisher of the Chattanooga Times. He and 17 other newspaper executives were invited by General Eisenhower to visit the liberated concentration camps in 1945. This visit inspired him to write a series of articles for The New York Times describing his experience and feelings. 306th Infantry Regiment, 77th Division, A.E.F. The Distinguished Service Cross is presented to Julius O. Adler, Major, U.S. Army, for extraordinary heroism in action at St. Juvin, France, October 14, 1918. Accompanied by another officer, Major Adler was supervising the work of clearing the enemy from St. Juvin where they suddenly came upon a party of the enemy numbering 150. Firing on the enemy with his pistol, Major Adler ran toward the party, calling on them to surrender. His bravery and good marksmanship resulted in the capture of 50 Germans, and the remainder fled.